More people call Asia home than any of the earth’s other six continents, with some of the most populous countries in the world - China, India, Indonesia, Bangladesh, Pakistan, Japan - lying on this huge, and diverse, slab of land. People often use the term ‘Asian’ fairly liberally, yet in reality, the continent is expansive, with hundreds of different languages being spoken, and a myriad of unique cultures. Of course, this translates into the food on offer in Asia. Here are five dishes you can’t miss if you choose to take the plunge and explore the continent. Sure, you might be able to get decent sushi in the likes of California, but nowhere on earth beats Japan when it comes to this delicacy. Expertly prepared and super fresh sushi is abundant, which you’d expect from the land that created the dish that’s now enjoyed around the world. For a true culinary experience, head to Tsukiji Fish Market in Tokyo, where you’ll be able to see traders selling huge slabs of tuna, salmon, swordfish, and other assorted seafood, which then get chopped and sliced by chefs. Expect to wait for breakfast though - queues at the market can be a couple of hours long, but boy, is it worth it. 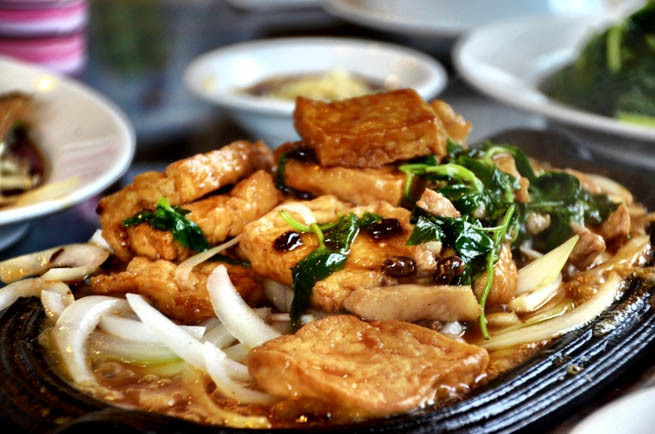 The likes of tteokbokki and bibimbap might get all the press when it comes to Korean food, but if you want to delve a little deeper into Korean culture, then samgyeopsal is the dish to try. Samgyeopsal is basically just pieces of fatty pork that are cooked on a communal grill. Once cooked, the pork is then placed on a cabbage leaf, and topped with soybean sauce, raw garlic, kimchi and onions, rolled into a ball, and then eaten all in one. Samgyeopsal is best washed down with somec, a mixture of beer and soju, Korea’s national liquor. The countries that make up Central Asia - Kyrgyzstan, Kazakhstan, Uzbekistan, Tajikistan and Turkmenistan - are the last frontier in Asia for the truly adventurous and those who really want to veer off the beaten path. While each of these former Soviet republics has its own distinct culture, one food you’ll find in each of them is shashlik. Made from tender strips of skewered lamb or mutton, and often served with peppers and onions and a sauce made from sour cherries, shashlik is heaven on a plate for carnivores. The Asian breakfast to beat them all, nasi goreng is Malaysia’s answer to pancakes with maple syrup, or an English fry-up. Fried rice served with chilies and garlic, mixed in with soy sauce, and possibly some chicken or shrimp, nasi goreng is a great way to start the day, especially since it’s then topped with a fried egg. If you find yourself in Malaysia, track down a street side breakfast shop and make sure your day begins with a kick of spice. If you were to ask me to name my favorite cuisine in the world, I’d say Indian without hesitation. From the arid north to the wet and tropical south, India is stuffed full of delectable food that will have you drooling. Familiar dishes like samosa, bhajis and kati rolls are stuffed with flavor, and of course no trip to India would be complete without curry. A haven for vegetarians, a lot of Indians don’t eat meat, meaning that scrumptious, meat-free dishes like baingan bharta (roasted eggplant mashed with other vegetables) and bhelpuri (puffed fried rice served with vegetables and covered in a tangy tamarind sauce) are widely available. Which one of these delicious dishes do you want to try first?